The Middle Fork of the Salmon ranks as one of the world’s best trout-fishing streams – and no one fishes it like Far and Away Adventures. We’ll help you design the Idaho fly fishing trip of your dreams, complete with a drift boat, Orvis equipment, and custom, hand-tied flies. Our Idaho fly fishing trip on the Middle Fork of the Salmon River gives you a great fishing experience. 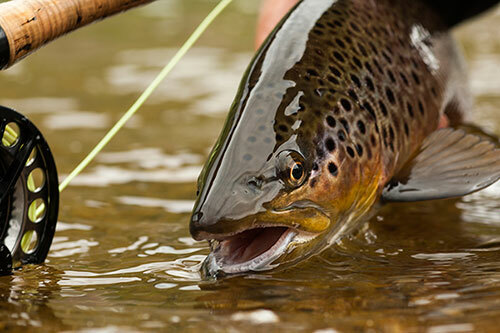 Our guides are on top of the fly-fishing game, whether that’s dispensing fly pattern-matching advice for the seasoned fly-fisher or helping a novice get comfortably into the back-casting swing of things. And the fish are plentiful, from deep-bellied, native west slope cutthroat to the highly spirited rainbow trout. The Middle Fork of the Salmon river is the most prized wilderness river trip in North America, if not world. Far and Away adds a unique, multi-dimensional luxury component to the Middle Fork experience, making it a trip-of-a-lifetime, a truly memorable and comfortable experience for your family and friends.